The winter holiday season often involves some travel in one form or another to bring distant family members together. Like many families my wife and I would driving from our Chicago home to Southeast Michigan to be with our eldest daughter along with her husband and their two young children. Our younger daughter and her husband would join us there, arriving by airplane, and then travel back to Chicago with us on our return road trip. 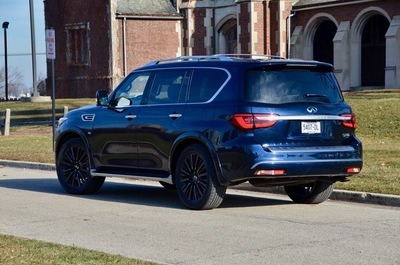 My “wheels of the week” for this Christmas road trip would be the very large and very roomy 2019 Infiniti QX80 full-size SUV. Driving the interstate from Chicago eastward during winter can become precarious at times. Lake-effect snow around the southern tip of Lake Michigan frequently makes for snow covered, slippery roads. The heft of the QX80 with its powerful V8 and four-wheel drive should be able to get us through safely and confidently, if snow were to challenge us. Of course, I knew the QX80 was no fuel sipper, but that’s the trade off. Cabin space would be all important on both legs of our trip. Heading east along with luggage for two, we had Christmas gifts. On the return west, there would be two additional passengers, their luggage, plus their Christmas gifts that needed to go back home with them. The nearly 50 cu.ft.of cargo space behind the second-row seats…with the third-row power-folding seats flat, would be plenty. SUVs are hot. Big SUVs too. Low gasoline prices help that. And, if you need lots of space for people and stuff as many younger families do these days, why not go big? My older daughter drives a large SUV. When she visits us in Chicago the rear cargo area is loaded to the gills with all the things she needs for two toddlers. The QX80 was refreshed in 2018. It’s very similar to its cousin the Nissan Armada but of course with more premium features. Both are based on the Nissan Titan pickup and are body-on-frame architecture. 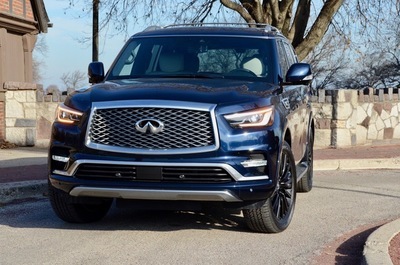 I noticed the trucky-ness of the QX80’s ride right off the bat. This probably was more evident to me as I had recently driven the new Lincoln Navigator, which is quite refined. Steering felt a little light to me, perhaps over boosted at low speeds. However, a mom might be very happy with that feel and lower effort. Climbing into the driver’s seat another first reaction was that the seating position was too high. I like to sit low, and the QX80’s power driver’s seat didn’t go low enough to suit me. On our road trip east, my wife made the same comment as she sat in the front passenger seat. I guess this is a design with roots in the original pickup. The very smooth, large 5.6-L V8 with 400 horsepower and gobs of torque together with the 7-speed automatic, which works really well, do a great job of moving the QX80. The four-wheel drive has a mode selector for different terrain and road conditions. The QX80 is rated to tow up to 8,500 lbs. I wouldn’t be doing any trailer towing, but the heft and capability of the QX80 makes it a very good choice for that task. In bygone days, I hauled around a 20ft boat and have experience having the right vehicle for the job. I wasn’t displeased with the QX80’s fuel consumption on our trip. Heading east across the relatively flat Michigan we were getting 17-18 mpg. On the return west, with two additional people, a bit more luggage, plus driving into the typical prevailing wind out of the west we got 15-16 mpg. This compares well to the EPA test-cycle rating of 15 mpg combined with 19 mpg highway and 13 mpg city. Another thing that makes for a good road trip is long driving range. The QX80 has a 26 gal. fuel tank that makes for a day’s drive with no refueling stops. 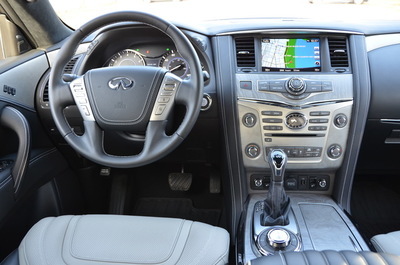 Inside the cabin, like inside your home, is where you want comfort and the QX80 delivers on that. Up front the seats are comfortable and supportive. Outward sight lines are clear and unobstructed, although the heavy A-pillar and large outside mirror can hide a close object or person if you are not observant. The surround-sound 15-speaker Bose audio is wonderful. My daughter and her husband commented on all the room they had in the two captains chairs in the second-row. 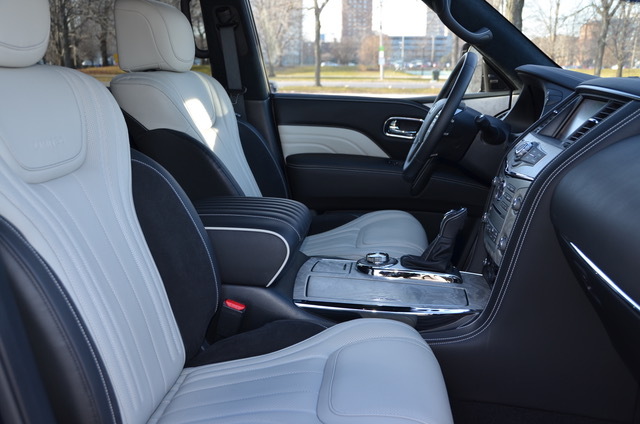 The QX80 seats seven, but there is an optional 2nd-row bench to make room for eight. 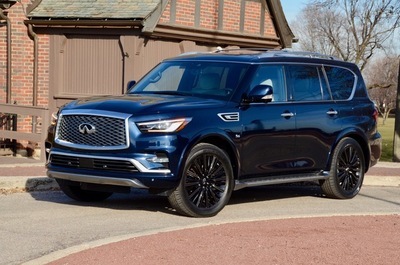 The 2019 QX80 is offered in Luxe (two-wheel drive), Luxe AWD and a new Limited AWD model. New for the 2019 model year, Luxe models add standard Forward Emergency Braking with Pedestrian Detection and Predictive Forward Collision Warning. Prices start at $65,100 plus a $1,295 destination charge. My QX80-for-a-week Limited had a base price of $89,800. More details, information and specifications can be found at www.infiniti.com. Overall, the QX80 has a good place in the full-size SUV market. It offers plenty of power and performance, a very comfortable and premium-equipped cabin, and a lot of real capability. 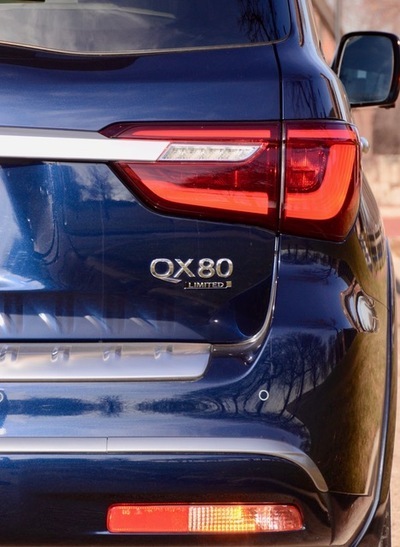 For someone who wants the combination of luxury and real usability, the QX80 is worth a test drive. The Most Independent Infiniti Research Information; Anywhere!